Sen. Lindsey Graham defended President Donald Tump’s dealings with North Korea and immigration in a Friday CNN interview. GOP Sen. Lindsey Graham defended President Donald Tump’s leadership tactics in a feisty Friday interview on CNN. 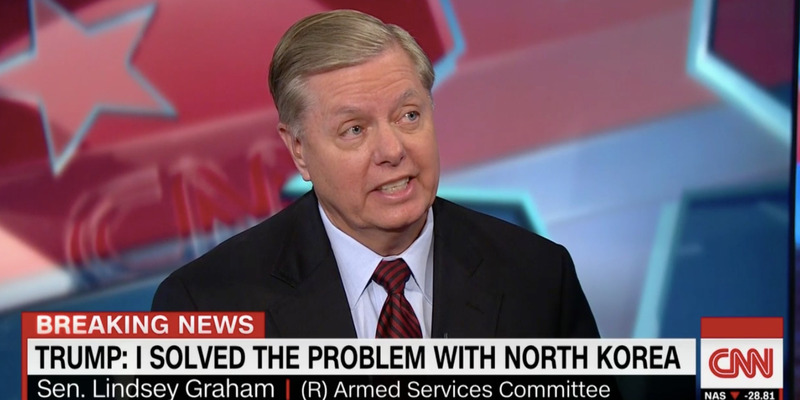 When host Kate Bolduan asked about Graham’s past as a vocal Trump critic, Graham said he would do what’s best for the country and world, despite his personal opinions. “I’ve got a relationship with the president at a time when I think he needs allies,” the Republican senator said. “When I worked with President Obama – and I did on occasion – I was a hero. Now when I work with President Trump, I’m two-faced. In the past, Graham has been vocal about his opinions on Trump’s moves. Trump had a testy exchange during a press gaggle in front of the White House on Friday with a reporter who asked how he could overlook Kim Jong Un’s human rights abuses for the sake of facilitating denuclearization in North Korea. “You know why? Because I don’t want to see a nuclear weapon destroy you and your family,”Trump said. Graham called it “the most honest answer he could give” and when Bolduan asked if the comments had gone too far in justifying Kim’s record, Graham said he believed the president meant he would rely on “his own judgment, his own negotiating skills” to strike a deal for denuclearization. “If he believes buttering the guy up will get rid of his nuclear weapons, butter the guy up,” Graham said. This was Graham’s second interview this week in which he touted Trump’s leadership skills in reference to his dealings with Kim. Sen. Rand Paul commented earlier this week that Graham is a “danger to the country” for suggesting military force against North Korea would be appropriate if Trump’s denuclearization deal failed.